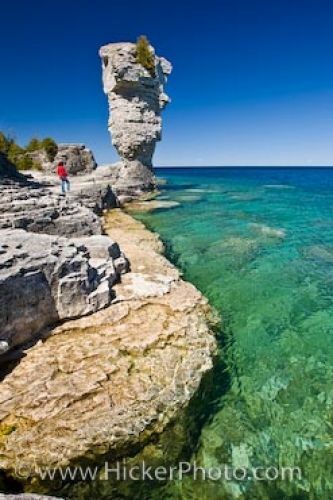 Many tourists cross the waters of Lake Huron in Ontario, Canada to explore Flowerpot Island where these rock formations, or sea stacks, have formed. A tourist stands near a sea stack on Flowerpot Island which has formed along the shores of Lake Huron in Fathom Five National Marine Park in Ontario, Canada. The beautiful blue and green hues of Lake Huron fringe the shore line where these strange rock formations have been formed by the waves crashing against the limestone, eventually eroding them into these unique shapes. At one time, there were three flowerpots which had formed on the island, but in 1903 one of them could not holdfast any longer and fell, crashing into pieces. Tours to Flowerpot Island leave from Little Tub Harbour in Tobermory, Ontario at different times throughout the day from the onset of May through to the middle of October. Picture of the unique rock formations at Flowerpot Island surrounded by Lake Huron in Ontario.